Hakeem Olajuwon is regarded as one of the best big men to ever step on a basketball court. As a NBA pro and collegian at Houston University, Olajuwon has done it all. He has been to the Final Four three times in college as part of the famed “Phi Slama Jama” (along with teammate Clyde Drexler), been to three NBA Finals (winning twice in ’94 and ’95), and won virtually every major individual award including MVP, Finals MVP and Defensive Player of the Year. He is currently the all time NBA leader in blocked shots and ranks tenth in scoring. As an offensive player, he had no equal: he had a dazzling array of low post spins and fakes that he used to score more than 26,000 points, in his 18 year NBA career. He even had his own signature move dubbed, “The Dream Shake”, which was virtually impossible to defend. After his retirement from the NBA in 2002, Hakeem moved with his family to the country of Jordan to focus on his devout Muslim faith until he received the ultimate honor in 2008: induction into the Naismith Basketball Hall of Fame. Hakeem has resurfaced in the form of teacher and mentor to many of the NBA’s young big men. In 2006, he opened his own Big Man Camp, teaching his excellent footwork and amazing offensive repertoire. He has worked with many emerging professional players including Yao Ming of the Houston Rockets, and Ameka Okafor of the New Orleans Hornets. 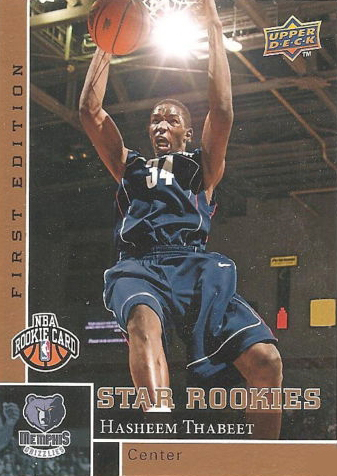 His most recent up and coming pupil is Hasheem Thabeet, who was drafted #2 overall by the Memphis Grizzlies out of UConn in the most recent NBA Draft back in June. Thabeet and his agent sought out Olajuwon’s services in an attempt to give the 7’3 shot blocking center some low post offensive moves to match his already dominating defense. Thabeet has looked up to Hakeem as an inspiration since both have taken similar paths to the NBA. Both players started as soccer players in their native countries in Africa before dominating competition in NCAA Basketball, followed by the professional ranks. Olajuwon believes that with hard work, Thabeet can have a long and very productive NBA career: one that could parallel his own. Olajuwon was surprised when former MVP and four time NBA Champion Kobe Bryant also expressed interest in working with the Hall of Fame big man to improve his front-court skills. Hakeem was both shocked and thrilled to have the opportunity to teach his moves to a player of Bryant’s stature, since most of his clientele have been slower front-court players. Olajuwon had always felt that his fluid and flexible style of play is really more suited for bigger guards who possess better agility than the larger plodding centers. Hakeem was honored when Bryant told him, “You are the best at the mid and low post moves”, and that he wanted to learn from the best. Adding “The Dream’s” moves to one of the most skilled all around players in the history of the game is scary. After all, Bryant has already scored more than 23,000 points and is arguably one of the most difficult players to defend. His desire and dedication to perpetually get better is what makes him an all-time great, and will ultimately land him in the Hall of Fame as well. In what is perhaps the most inspirational part of this story is that Olajuwon’s generous efforts to help teach his outstanding moves to other players is a service he provides for free. He says it is his way of giving back to the game which has greatly improved his life of humble beginnings in Africa.